WHAT WE FILIPINOS SHOULD KNOW: Note: Underlined words are HTML links. Click on them to see the linked postings/articles. Forwarding the postings to relatives and friends, especially in the homeland, is greatly appreciated. To write or read a comment, please go to http://www.thefilipinomind.blogspot.com/ and scroll down to the bottom of the current post (or another post you read and may want to respond) and click on "Comments." Any seriously thinking and concerned Filipino will note that the dominant orthodoxy is globalization aka neoliberalism supposedly for us to economically catch-up , to attain economic/material progress --for an underdeveloped country like ours. Any young Filipino who takes a course in political economy/economic development essentially obtains exposure solely in the gospels of Adam Smith and David Ricardo, i.e. on the "market system" with its "invisible hand," and "comparative advantage," respectively. They are the gospels of the current economic thinking or orthodoxy that are preached as the only way to progress for less-developed countries (LDC) or underdeveloped countries like our homeland to escape poverty, to making economic miracles, to better standard of living. 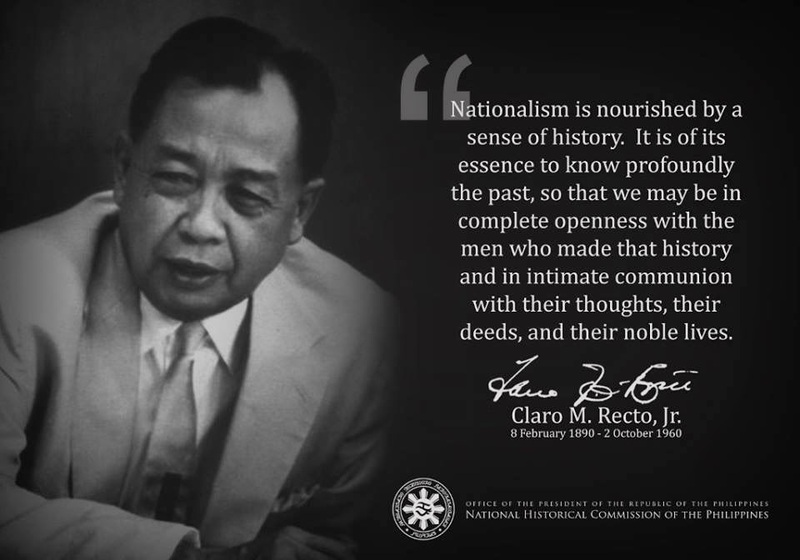 To the knowledgeable Filipino, he knows that our technocrats were early signatories to the secretive agreements/negotiations with the WTO and its trading rules (replacing the GATT)--the organization created in 1995 by the rich countries led by the G7 club and enforced by the IMF and WB combo ostensibly founded to help the poor countries towards development. With the signing, the next 14 years to the present are and in the foreseeable future shall be full of the same punishments: deeper, greater and wider impoverishment to our fellow native Filipinos. All these punishments will be endlessly worsening for the born and unborn generations unless native Filipinos in the homeland become educated, raise their nationalist consciousness, understand and become united to act against our technocrats and rulers with their foreign partners/sponsors ( resident foreigners and transnational corporations (TNCs) who maintain and spread lies and who obviously have much to gain from our dumbing down and resultant massive ignorance and disunity. Below is another eye-opening article, a commentary on the book "The Lexus and The Olive Tree (Thomas Friedman of the NYTimes)" by the highly regarded and influential Korean author Ha-Joon Chang, a Professor and Director (specializing in) of Developmental Economics at the University of Cambridge (England). I have just started reading Ha-Joon Chang's works and I find his factually-based analytical publications highly recommendable to those who seriously want to learn and understand the truth about economic history in the Western world and the Asian economic miracles of recent decades and compare where our homeland and our people are after religiously following and doing what our Americanized minds dictated. Let me start my talk with a little story. In 1958, Japan tried to export this first passenger car to the US market. The company was Toyota, the car was called Toyopet. And, as you can guess from the name, it was a very cheap, small subcompact car, more of a four-wheels-and-an-ashtray kind of thing, which Toyota hoped rich American consumers could pick up as an afterthought, after finishing their grocery shopping with the changes left. Unfortunately, it was a total flop, so much so that Toyota actually had to withdraw the product. In the realm of failures, this is, like, the biggest thing. It's not just not selling well -- it had to be withdrawn from the market. This provoked a very heated debate in Japan. The free trade economists centered around the Bank of Japan, the central bank, said, "Look, this is what happens when you go against the theory of comparative advantage. In a country like Japan, which in relative terms has lots of labor and little capital, we shouldn't be producing things like motor cars, which are very capital-intensive in production." Of course, at that time, Japan's biggest export item was silk. So, case proven, already. And they said, "Don't tell us that you couldn't succeed because you didn't have help. You had 25 years of very high tariff protection. We kicked out all the foreign car makers 20 years ago and didn't let any of them in since then. And back in 1949 this central bank even injected public money into Toyota to save it from bankruptcy. So, please don't tell us that you couldn't succeed because you didn't have help, because you had all the help you can ask for." You know, today, it sounds strange that the Japanese were debating whether to keep producing motor cars. It's a little like the French having national debate on whether to discontinue wine production or the Scotts deciding whether to do away with the smoked salmon industry. But if you went back in time and thought about this from the vantage point of view of 1958, actually I think the free trade economists made more sense. What was Japan? I mean, Japan's income was basically at the same level as that of South Africa and Argentina. In 1961, as late as 1961, Japan's per capita income was $402 in current terms, and Chile's income was $378. It was a very poor country, whose main export item was silk. Well, luckily for Japan, and I'd say for the rest of the world, which subsequently benefited from efficient Japanese cars, the protectionists won the day, and the Japanese government continued with the support for the industry, and, as you know, the rest is history. So, when you meet a free trade economist next time, ask him what car he drives. If he drives a Toyota or for that matter any other Japanese car, he doesn't know what he's talking about, OK? Now, it gets better, because the ironic thing is that, half a century after the Toyota debacle, Toyota's luxury brand Lexus has become something of an icon for free market globalization thanks to the American journalist Thomas Friedman. Some of you at least must have read this book The Lexus and the Olive Tree. Quite a wacky title. I mean, I like wacky titles, so no problem there, but, for those who haven't read this book, the title remains a complete mystery, so let me explain why he calls it that. At the beginning of this book, he says: I went to Japan in 1993 or somewhere around that time, and I went to visit a Toyota factory that manufactures their luxury brand Lexus, and I was bowled over -- this factory was so efficient, so clean, so quiet, so everything . . . I saw the future. And he continues: on my way back from the factory to my hotel in Tokyo, riding on a famous Japanese Shinkansen bullet train, eating my sushi bento lunch, I was reading the International Herald Tribune and came across yet another article about killings in the Middle East. And he has an epiphany, you know. He says: then it really hit me -- half the world is either making things like a Lexus or at least trying to earn money to buy things like a Lexus . . . and the other half is stuck in the past. These people in the Middle East are fighting over who owns which olive tree. These people should wake up -- there's a whole new world out there. Well, to be fair to him, he says that this olive tree world could exist with the Lexus world in the same country, in the same person, and so on and so forth . . . I don't want to be unfair to him, but basically his message is that these countries who live in the olive tree world need to wake up, put on what he calls the Golden Straightjacket, basically a set of pro-market, neoliberal policies, made up of tough control on government spending and inflation, liberalization in trade and investment, privatization of state-owned industries and state pensions and so on. And he says that this is the only way to survive. I'm sorry if this Golden Straightjacket isn't comfortable, but unfortunately this is the only model that is available in this historical season. . . .
Now, the crazy thing is, go back to the earlier Toyopet example, when you think about that, basically, if Japan had followed Friedman's kind of advice in the 1950s and 1960s, the Japanese would not be exporting the Lexus, because Toyota probably would have been either wiped out or more likely taken over by General Motors and made into some secondary producer. They won't be exporting the Lexus but they will be still fighting over who owns which mulberry tree, the tree that feeds silkworms. You know, this is so crazy: it's like someone writing a book on self-made men, and the first chapter is Henry Ford II. Ha-Joon Chang is a reader in the political economy of development at the University of Cambridge and a senior research associate at the Center for Economic and Policy Research. He is the author of Bad Samaritans: The Myth of Free Trade and the Secret History of Capitalism (2007) and Kicking Away the Ladder: Development Strategy in Historical Perspective (2002) among numerous other publications. The video was produced by the New America Foundation. The text above is a partial transcript of Chang's lecture.